24th November until 26th November 2017. Get Tickets for the Abu Dhabi Grand Prix. How to Get to the Yas Marina Circuit Abu Dhabi. Abu Dhabi, or the Sheik Zayed (E11) highway from Dubai. Abu Dhabi International Airport is about a 15 minute drive. 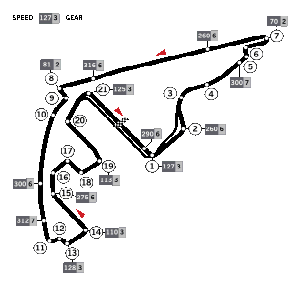 The F1 Yas Marina track is 5.55 km long. air-conditioned VIP facilities. The Yas Marina Circuit grandstands are all covered. The Yas Marina Pit Building has 40 garages for teams and officials and is surmounted by hospitality facilities. and drivers official merchandise to get for yourself or as a gift and different performance car driving experience days in the UK. to Dubai,Abu Dhabi Hotels and Dubai Hotels and Abu Dhabi Car Rental and Dubai Car Rental early to avoid disappointment. forward to seeing you at the Abu Dhabi F1 Grand Prix 2011.